Commonwealth Avenue route is the best option, says Minister. Image: Supplied. 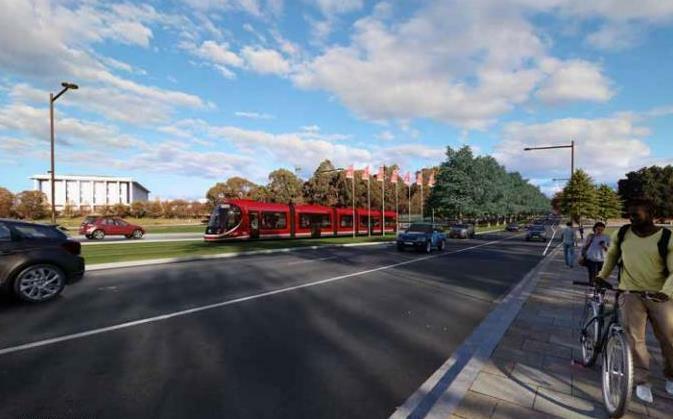 The ACT Government was unlikely to proceed with Stage 2 of the light rail network to Woden if it had to cross the lake at Kings Avenue instead of the preferred route down Commonwealth Avenue. In answers to Questions on Notice in its final submission to the Federal Joint Standing Committee inquiry into Stage 2, the Government says an analysis of that route shows it would cost more, take longer, carry fewer passengers and would affect the viability of an expanded network. It would also mean about 40 significant trees planted by Charles Weston would have to be removed. It argues that the preferred route via Commonwealth Avenue and Barton would attract more passengers, service more areas and make way for a future light rail route from Belconnen to the Airport. Minister for Transport Meegan Fitzharris said that Commonwealth Avenue Bridge was the best option when considering the broader light rail network. “Canberra is best served by a north-south light rail spine via Commonwealth Avenue, which will provide better light rail coverage through the City and Parliamentary areas, and result in higher passenger numbers, fewer significant trees needing removal and better travel times,” she said. Ms Fitzharris said the ACT Government was unlikely to invest in the project should it be required to cross the Lake at Kings Avenue. “Up until now all our planning and design has been for a City to Woden route that crosses the lake at Commonwealth Avenue. Crossing the lake at Kings Avenue to get to Woden would increase the cost to around $1.9 billion, while isolating vast areas of the city,” she said. Ms Fitzharris said a network view, rather than looking at each light rail corridor in isolation, would ensure future light rail routes were most effective. 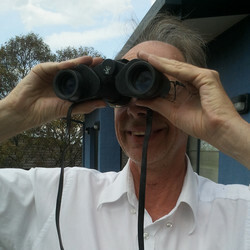 “I’m not just focused on light rail to Woden. I’m now looking at where to for stage three, four and beyond,” she said. She urged the Joint Standing Committee to think about the broader network and public transport outcomes the ACT Government was seeking to achieve when considering their approval processes for light rail Stage 2. The Government also stands by the National Capital Authority’s assessment of the trees on Commonwealth Avenue earmarked for removal as being in decline with a limited life expectancy, due mainly to ageing differently in the Australian environment. Click here to view the ACT Government submission. If there has to be a stage 2, it should run from Belconnen to the airport via UC, AIS, ANU, city centre & Russell. A business case for this route as stage 1 instead of the non viable route down Northborne may have killed off opposition to the tram. With the current stage 2 having a high cost to cross the lake and there being an efficient busway down Adelaide Av at the moment that would be replaced, the route to Woden should be shelved. Garfield, agree that Belconnen to Airport via educational institutions (where viable) would be an important however that doesn’t make the Gungahin to City via Northbourne route any less viable. Gungahlin is a very fast-growing and large area and needs connection to the City. However, concerning Stage 2, there is an obvious balance between north and south sides of the city to go for the Woden route, albeit Belconnen is having obvious transport issues with the inevitable growth of more densely populated areas around the town centre. What puzzles me is opposition to a light rail carriage appearing in the Parliamentary Triangle by people who don’t seem to mind motor cars in the Parliamentary Triangle, Some people have odd aesthetic tastes. I’m not going to argue that public transport between Gungahlin and the city didn’t need to improve, but when more than 90% of the benefits could have been provided for less than half the cost according to the governments own analysis of BRT vs LR, then the current stage 1 of the tram never should have received a green light. In contrast a Belco to the airport LR route would most likely have much higher passenger numbers outside the morning & evening peaks and may have come out ahead of a comparable BRT option. But we’ll never know because the decisions have been made based on politics rather than business cases. Ironically you are right Belconnen does have higher numbers off peak due to what it passes on the way. Why is it ironic? As I’ve said before but one thing people object to with the Woden route is the Barton detour which will add up to 10 minutes to the trip. But go back in time and the City to Belconnen bus, the old 333 used to be more direct and much quicker. Then they diverted it via College Street which added 5 minutes to the trip which with traffic congestion is now closer to 10 minutes. That diversion added UC, Radord, CIT and Calvary hospital to the route which generates a lot of traffic so well worth while. But appreantly that is ok because it provides an extra service (at a time cost of course) but doing the same to the Woden route is the end of the world as we know it. Oh and for what it is worth the current 200 bus is often reasonably full off peak too, not quite as much as Belco but full none the less. And during peak it is not uncommon to see his full signs, something I’ve not seen elsewhere in Canberra and there about 14 buses an hour Gungahlin to city in the peak so no shortage. But still often full to capacity. I actually think a couple more LRV’s will be required for Gungahlin or add in an extra two modules to each (which is easily done with the Urbos 3 LRV’s). Increasing the LRVs by 33% will delay the cross traffic wherever there are traffic lights. Really? Delay by 33% by being longer. Have you had a look at the plans for light rail and in particular the traffic light phasing plans? Google then they make an interesting read. Forget Google, and you don’t need a slide rule to tell you that something that increases in length by one third will take one third more in elapsed time to pass a fixed point. Well done in promoting the flexibility of buses again, that change in the 333 route shows how bus routes are far more easily changed to match demand. Chewy sometimes flexibility is not needed. And look at Woden where some flexibility is being proposed adding the same time as the Belconnen bus diversion all those years ago and people are up in arms about it. Go figure no one can ever be pleased in this town. Business case (at 1.6.3) has benefit:cost ratio at 1:2. ‘As the total BCR is greater than one, the economic analysis anticipates the project will deliver a net benefit to the ACT community.’ Business case therefore appear to support the project, as has the ACT electorate. Not much more to see here other that sorting out the order of the next stages and exact routes they will take. Astro, once again you’re completely ignoring opportunity cost. The fact that the ratio is bigger than 1 doesn’t mean the project should go ahead unless you assess it against other options and projects. It’s the reason why Infrastructure Australia didn’t see it as a project for funding because usually those numbers are far higher. So the analysis doesn’t show the project is viable or preferred. Particularly when the transport benefits are only 0.3 of the total benefit and the CBA itself was panned by the productivity commission as per Kent Fitch’s comment above. And even then, all of that ignores the equity of the project with everyone paying but the benefits accruing to a much smaller group of residents and land holders. Not much more to see except how quickly the government can work out the excuses to drop future stages because they’ll clearly not be viable. Hi, i’m not ignoring opportunity costs, just quoting the actual business case which shows a net benefit. There are always a number of ways to spend on infrastructure projects. I’d also call out wishful thinking if the anti-light railers are hoping that there will only be one stage of a major transport project. The benefits of the full project, including all the future stages, accrue to pretty much the whole of Canberra. I wouldn’t hold much weight to Infrastructure Australia not co-funding as they’re probably aware that Canberra can do this themselves. It still doesn’t support the supposed “unviability” of the Light Rail Project. There’s a lot of other projects they don’t co-fund. The same business case that showed that BRT could provide 90% of the benefits for one third of the cost? But yet, you claim to not be ignoring opportunity costs? OK…. Yet no such benefits have even been identified and quantified in any business case and you can provide no evidence to back up such a bold statement other than emotional platitudes and political soundbites. Hmmm, yes it’s the “anti-light railers” who are thinking wishfully right. Yes, a lot of non-viable ones. This level of illogical thinking is just embarrassing. No the actual business case, not your interpretation. A direct quote, not with an overlay of opinion. i’m not sure if you quite understand opportunity cost from what you expressed about buses. Also, you’ve not factored in the fact that buses use roads which have already been built whereas light rail hasn’t been built yet so obviously there’s a cost involved in that. It’s called infrastructure building. Perhaps it is worth mentioning here that almost all capital cities in Australia (excepting Darwin and possibly Hobart) have more than one type of public transport to service their urban environment. Canberra is following suit. In regards to Infrastructure Australia funding you may wish to read up a bit more on the process that is undertaken. It isn’t simply an equation of ‘viable = we’ll co-fund’ & ‘not viable = we won’t’. Getting back to what this article was about (and, no, it wasn’t about whether or not we should have light rail, that’s already been decided) it is difficult to put forward a sound case for a City to Woden via Kings Ave bridge route. Doesn’t make sense. It doesn’t appear likely at this stage that the Inquiry would try to mandate such a proposal. No, a Kings Avenue crossing makes perfect sense, you just don’t have the vision to see the benefits that would flow from such a forward thinking, bold and innovative approach to infrastructure planning and delivery by spending vastly more money to achieve the transport benefits that this route would unlock. Your rejection of this route just shows the shallow thinking of the anti Kings Avenue brigade, costs and benefits are too hard to fully quantify for such a futuristic project and I’m not sure if you truly understand the city building effect this route would have. It’s hard to make a case that this wouldn’t be a wonderful addition to this detailed and well planned project and I don’t need to back my statements up with evidemce because it’s really irrelevant to the discussion. No, Belconnen being important doesn’t make Stage 1 not viable as a public transport project, the government’s own business case does that for them. A transport cost benefit ratio of 0.3. So chewy you agree the benifit is positive? Not by much of course. If it were a commercial project you wouldn’t invest in it, but for a not for profit government that is well worth while. Pity most don’t understand that. no I wouldn’t invest in it and at those rates, the government shouldn’t either. If the benefits accrued were mainly around public transport, you could make an argument (barely) that the not for profit government could reasonably spend money on it for the social aspects of the project but the main benefits on the government’s own figures are related to land development. It is predominantly a land redevelopment project, not a transport one. So the opportunity costs of such a project are crucial and there’s no way in the world that this is the best use of limited government resources for the benefit received. It’s a pure vanity project that is valuing politics and “legacy” over proper infrastructure and transport planning. You keep harping on about opportunity cost. As you point out stage 1 is for the most part an urban renewal project (which is why I support that but an in record many times saying I don’t support Woden). So using the opportunity cost let’s say they didn’t do stage one and the urban renewal what happens with all those decaying flats down Northborne and where exactly do we build and fund new estates to put the people who need to be housed. Who said they shouldn’t do the urban renewal? This is the problem, you’re taking the light rail and urban renewal as a package when they can easily be split. The transport requirements and benefits could have been easily achieved with a bus system and provision for a rail system (or newer technology) when/if the demand for such extra capacity is needed in 20-30 years due to the urban development increase in population. So they could have delivered almost exactly the same benefits for a fraction of the cost, which is why opportunity cost is so important and why no decent infrastructure body would have gone near funding the project in a fit. If they wanted to rush the project and do it now, they should have funded it through a direct levy on landholders along the route who are the main beneficiaries of such unjustified government largesse. You seem to be OK with the government wasting money on vanity projects to build a legacy, I’d prefer good long term infrastructure planning and the most efficient use of our tax dollars. See the demand for rail is there now not in 20 or 30 years time. And besides I want a government who looks and provides for the future not one who does things half arsed after the fact. The demand is clearly not there based on the government’s own figures and it’s completely misleading to say it is. This information is in the business case. Light rail’s viability demands a high population density that does not exist yet and won’t for a few decades. This is the trap that many people fall into when considering infrastructure, that they believe doing something is always better than nothing, when often the opposite is true. Good planning involves investing the right amounts in the right solutions at the right time. Your way of thinking is why we end up with massive gold plated white elephants. The choice isn’t between a gold plated solution or doing something “half arsed after the fact”, its between wasting hundreds of millions of dollars now or engaging in proper long term planning to allow structured and flexible implementation of the right solutions when they are needed. A very poorly conceived project by ACT Labor and the Greens. The cost of this project is huge, and it’s accompanied by increases in a broad range of taxes and higher parking and other prices in the city. Now we find out that ACT Government didn’t even look at the feasibility of, and gain the approvals for, the continuation of the project. This just demonstrates how clueless our Government is, as you don’t start a project of this magnitude unless you have planned it through to completion. There are other transport modes that would have worked across the whole of Canberra with far less cost and destruction. This tram’s a white elephant. I think your understanding of how projects start and then process is not up to scratch or well informed. They are going through the planning process but are facing a massive brick wall in the NCA and old mate Zed and Co. planning means working with them not just giving up and doing nothing saying it is all too hard. Liberal governments really like doing nothing which is why we end up in the situations and massive costs when eventually a labor government starts projects. If they were truly interested in “planning”, they would have sorted out the issues with the correct planning authority well before approving or commencing Stage 1. Surely this ACT government didnt really say they wouldn’t build a light rail route because of the cost and delay on travel times for commuters? How did they keep from bursting out laughing? “… the Commission highlighted the ACT light rail project as an example where the costs of the project were likely to greatly exceed the benefits, and where an alternative public transport project (bus rapid transit) was available that would provide similar benefits at 1/4 of the cost. “As the Commission also noted in the report, for large infrastructure projects, such as this light rail project, project proponents systematically underestimate the costs and overestimate the benefits. This tendency (optimism bias) has been well highlighted by the UK economist Bent Flyvbjerg who used an extensive database of infrastructure projects throughout the world to reach that conclusion. “I will leave it to the Committee to ponder the relative attractiveness of light rail when such projects have consistently seen major cost blow outs (see the Sydney light rail project currently underway). But perhaps they (or their Treasury, or representatives of many worthy projects stalled for want of funding ) have, and we are now witnessing the preparation for a withdrawal with some honour. Kent, I think Honour left the station some time ago, heading for the Pretext station, then all stations to AnyExcuseWillDo. If this provides a pretext for backing out of stage 2 of this idiotic vanity project, then that will very good news for the people who actually pay the extortionate rates and other taxes which keep the circus rolling on. They always knew there wouldnt be a stage two. Constitution av was already redone not wide enough for a tram. They wanted to drive up interest in woden which just got a developement boost which will now lose attractive rail. Whats that building in woden with the light rail signage theyve been selling. I’d have thought you’d actually make sure potential showstoppers like which bridge would have been resolved before proceeding with building even stage 1 of a network. If there’s no resolution of getting over the lake, the network is pretty pointless so why even start stage 1? What happens now if the Feds say no deal on both bridges? Stage one can standalone on its own without extensions. Extensions add to it not make it viable. I don’t think the business case says it stands up at all, once you discount all the fake benefits claimed. Stage 1 alone is a novelty. Only as part of a city wide network is it a public transit system. Of course Stage 2 will never go ahead; everybody got what they wanted from Stage 1 and nobody has the stomach for another go. There never was a ‘Master Plan’. Don’t forget the whole thing started as a sop to win Green support in the Assembly, THEN a laughable ‘Business Case’ was cobbled to together to justify it. It’s done. The politicians involved have now got their name on a multi-billion dollar showcase ‘Green’ project, the boosters have got their real estate windfalls and their infrastructure contracts, and the ‘progressives’ have had a win over their reactionary opponents, who failed to see the ‘visionary’ nature of the project. Nobody cares that there will be few benefits for most Canberrans, despite the billions spent. The Irish amongst us would say do it again, to be sure, to be sure. Let’s see, the names Gallagher, Barr and Fitzharris are definitely Irish but Rattenbury is English. A couple of trivia questions: In the “supplied” image at the top of the article, why is it necessary to not show the overhead wires? and, why is the beautiful avenue of conifers in the median strip south of the bridge still standing? Perception is more important than fact. Because the place depicted is the Parliamentary Triangle where the trams have to be wire free. The reason is on commonwealth avenue there would be no overhead wires but a ‘third track’ in the ground similar to how the light rail operates in Bordeaux. Doubt they would go for ground power. Most/all of those systems are proprietary. The one you mention is proprietary to Alstom and is being installed in Sydney right now. End result the CAF Urbos Sydney brought (same as Canberra and Newcastle ones) when they extended stage 1 can not operate in the wireless section. Here I reckon they will go for rapid charge batteries and in fact the CAF Urbos they have brought can have them retrofitted at a later date and was one of the requirements in the stage 1 tender. All it needs is stops at regular enough intervals to give the batteries a boost plus time at each end under wires to give the batteries a proper recharge and to condition them. All proven stuff. The light rail would run on battery in the Parliamentary Triangle, charging at each stop. This is because the NCA won’t allow overhead wires. The Charles Weston planted trees would be removed. They are “in decline” according to the NCA and ACT Govt yet they live for 300 years elsewhere in the world. ACT Govt does not want to go the Kings Avenue route because the light rail is all about ‘value uplift’ from land sales and it does not own the land in the Parliamentary Triangle so it wants to cross Cwth land as quickly as possible. Overnight we hear of the dreadful fire in Rio de Janero which all but destroyed one of the greatest collections of artefacts of the Americas. The reasons as to why this could happen have been cited as failure of the government to fund the museum’s budget sufficiently to enable the proper measures to be taken to prevent such a fire. But hey, Rio has a brand new light rail so who cares? No, the fact that Brazilian governments don’t fund their museums adequately is a economic problem in Brazil. Nice try to link to light rail but no cigar. Cuba has cigars, Brazil (like Canberra) has debt.